A full framed, time proven solution, Vitality proves a great solution for even the most demanding leisure centres and swimming pools. 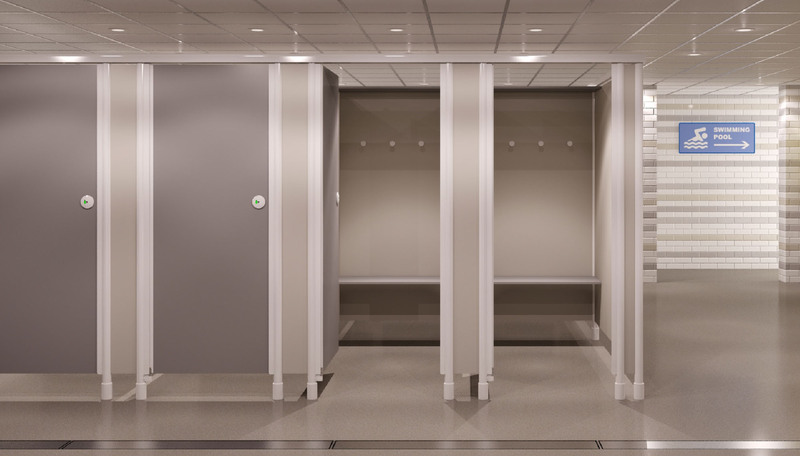 A fully framed cubicle system combining stress resistant aluminium profiles, aerospace grade aluminium bronze and stainless steel. Able to withstand continuous use in aggressive environments, providing years of trouble free operation. The polyester coated aluminium extrusions create a fully framed system supporting solid grade laminate panels that are impervious to water and are extremely resistant. A unique hinge prevents little fingers from being trapped and the door is supported on a single aluminium bronze bearing capable of outlasting the life of the cubicle. Anti-tamper stainless steel fixings prevent unsightly ‘rust staining’ and prevent vandalism.